The perfect gift for a loved one who enjoys keeping fit and being active are the Jabra Pace wireless sports earbuds. These earbuds are brilliant when you want to listen to music whilst working out as they fit securely and are easy to use. The Jabra Pace wireless earbuds are very light and comfortable to wear and as they fit around the ear they are secure and do not move whilst you work out. Another great feature is that these earbuds have a sports button that makes it easy to stop and resume play while you are working out. Connecting your phone to the earbuds is also very easy to do and you can pair the earbuds to your mobile phone as soon as you switch on the earbuds. These earbuds also have premium sound quality, making both your talk time and music time thoroughly enjoyable. I loved this feature as I love listening to music when I work out and need premium sound quality as music keeps me focussed and motivated. Another brilliant feature is that the earbuds only need 15 minutes of charge to give you 60 minutes of music or talk time. So if your earbuds have run out of charge, after 15 minutes they are ready for you to wear. If a full charge is needed, it takes approximately 2 hours and you can get up to 5 hours of usage. The Jabra Pace wireless earbuds are a fabulous gift for anyone who likes working out. They are available in 4 colours; black, red, blue and yellow. 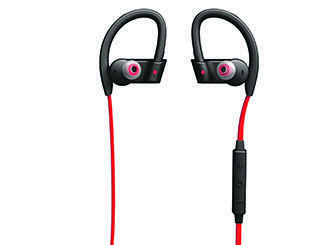 The RRP is £84.99 and they are available from www.jabra.co.uk.